How to Make Mini Tacos: BBQ Chicken Style! Watch out! 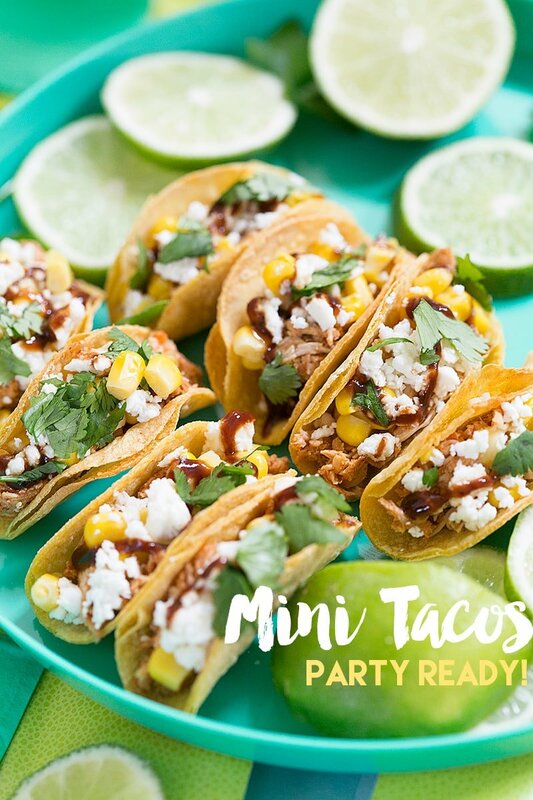 I’m back with another “mini” version of another favorite party food…TACOS!! Who doesn’t love tacos, truly!? It’s the ultimate crowd-pleasing fave! However, friends, you know me! 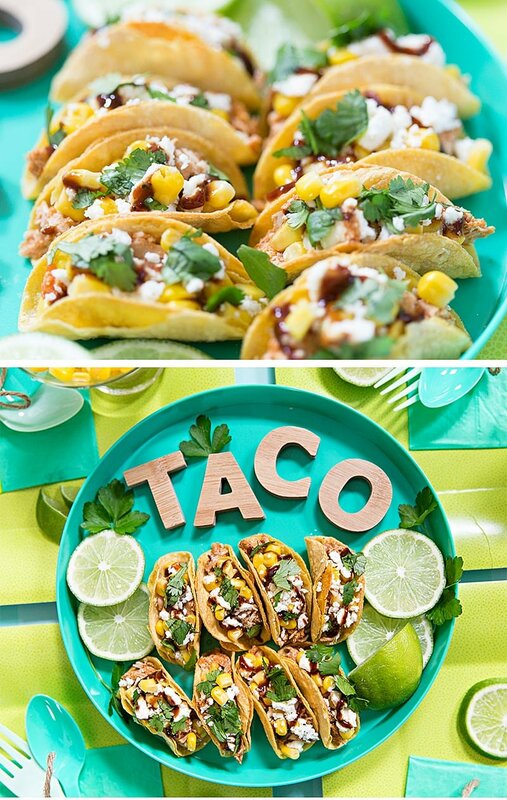 Food for parties is best served “mix and mingle” style so I am sharing my easy little trick for making teeny tiny tacos! You can serve them “soft taco” style or “hard taco” style, it’s up to you! 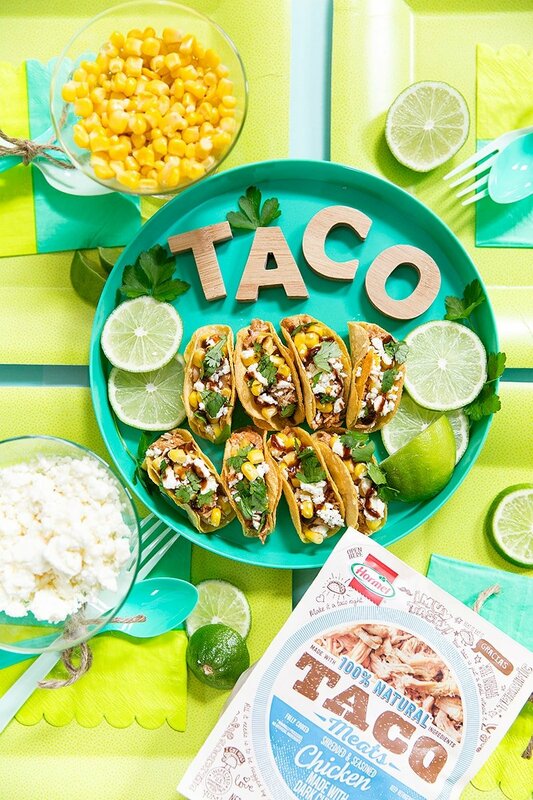 Plus, the hostess duties just got even easier because you can now find HORMEL® Taco Meats at the grocery store, hooray! Here’s why I love them: all-natural beef, chicken, or pork varieties, fully cooked, perfectly pre-seasoned, and easy to find (refrigerated section). Ok, enough chatter, let’s take a look at these adorable mini tacos (who knew a taco could be so cute)! Use a round cookie cutter (I used a 3 inch) to cut out as many mini taco shells as you want! You can use flour or corn tortillas, your preference. Quickly spray with non-stick cooking spray and microwave for 10 seconds to make them “bendable” without tearing. Turn a cupcake/muffin tin upset down and spray with non-stick cooking spray. Place your warm taco shells (folded in half) between the muffin spaces so they will bake in a “taco” shape! Ta-da! Take a look at your handy-work and get ready to fill them with your favorite toppings. Check out my recipe for Mini BBQ Chicken Tacos below. They’re DELISH! The perfect party food, try these delicious mini BBQ chicken tacos! Prepare taco shells according to post instructions. Fill each taco shell with chicken, corn, and feta. Garnish each taco with a drizzle of BBQ sauce and a sprinkle of diced cilantro. Check out more about the HORMEL®Taco Meats here! And check back soon for a super fabulous way to serve your tacos on taco night! Cheers! P.S. 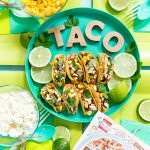 Follow along with #TacoGoals for more! How long do you bake the taco shells? Am I supposed to bake the shells? Temp? Time? How long and what temperature do you bake the taco shells? With the filling in them or without? Hi! I baked mine at 400 for about 15 minutes or so, until they started to brown a bit on the edges. Then let them sit and cool for a few minutes or they won’t maintain their shape. Instead of premade chicken, I also boiled my chicken in garlic and chili powder, shredded it and mixed it with honey bbq sauce, a touch of red hot and a bit of apple cider vinegar. They were yummy!